Coming back from our Costa Rica vacation the shop has been busy! Thank you to all our patient clients! Here is just a snippet of a few of the things we’ve been working on since getting back. 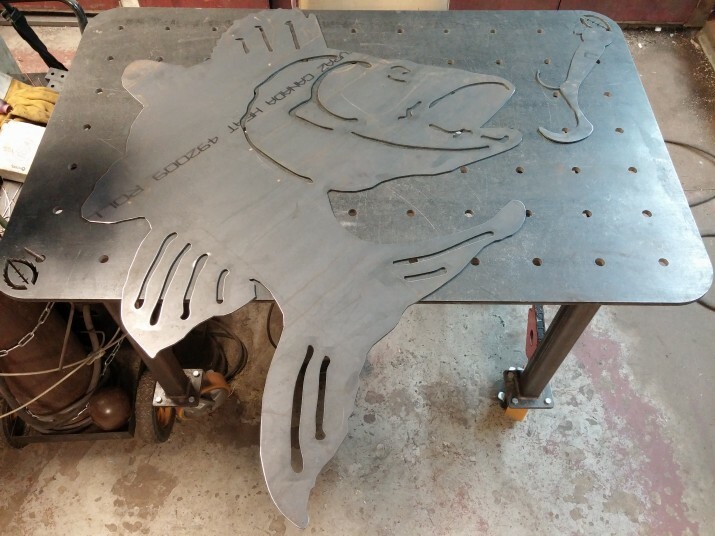 CNC cut 1/4″ 304 stainless steel plates, media blasted, with SS hardware TIG welded in place. 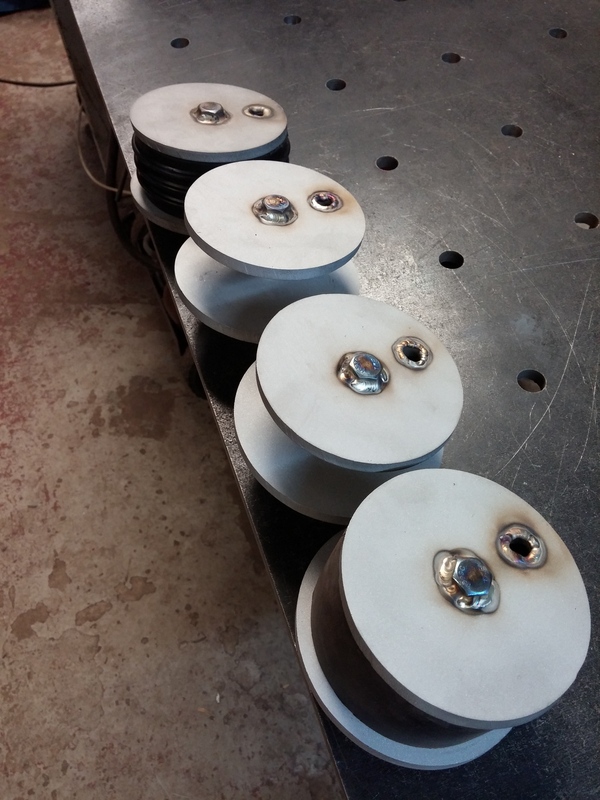 They’re used for checking pressure in a 4″ pipe at a dam site. Some 10ga signs cut with customer supplied artwork. 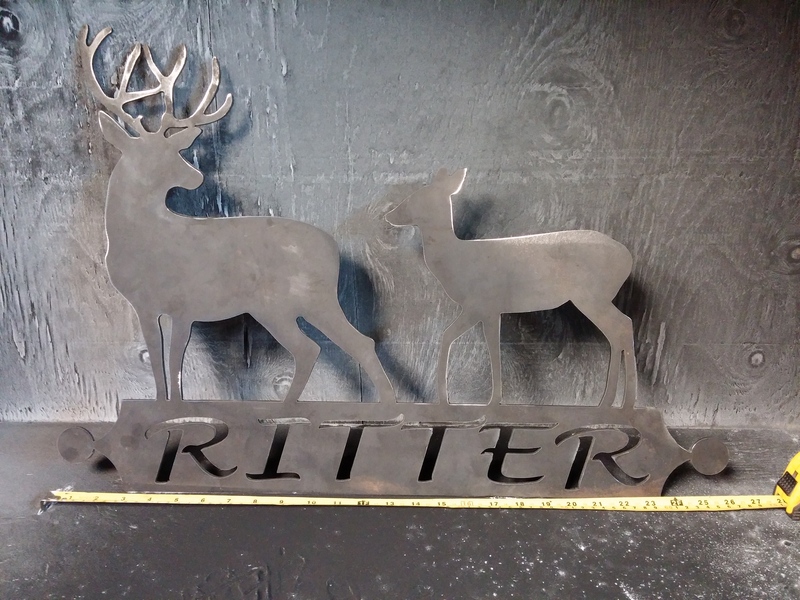 These will be painted and installed by the customer on a cabin somewhere in beautiful Saskatchewan. This fish was 36″x36″ and the lure is 19″ long. Also working on finishing up the prototype Möbius Threads backlit LED sign. The white LED strip was removed, an RGB LED strip was installed along with the drivers as well as a real time clock. So once programmed the sign will always know the date (until the lithium battery discharges in 5-10 years) and the date will control how the lights function based on season and special events without any intervention needed. 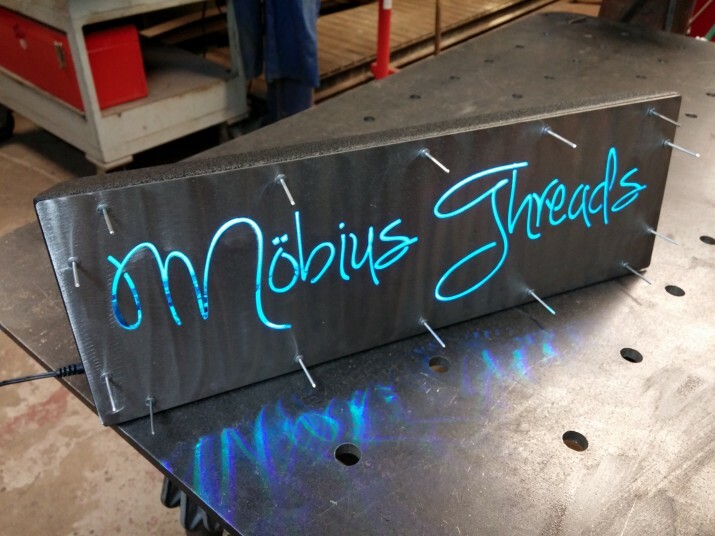 Keep your eyes posted for these popping up in and around Saskatoon wherever Mobius Threads products are sold. Here’s a short clip of it rolling through a few color sequences. 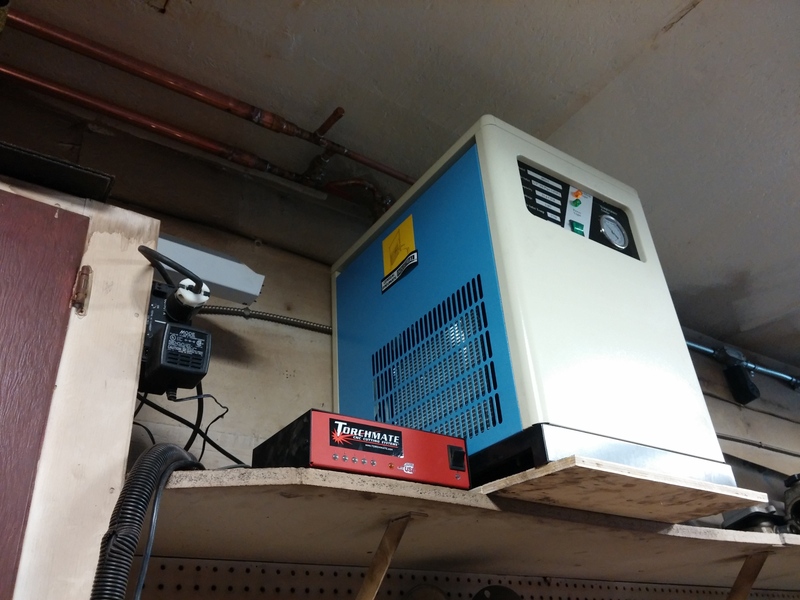 And this… Please excuse the dirty walls, this is in the very dusty dirty area of the shop. 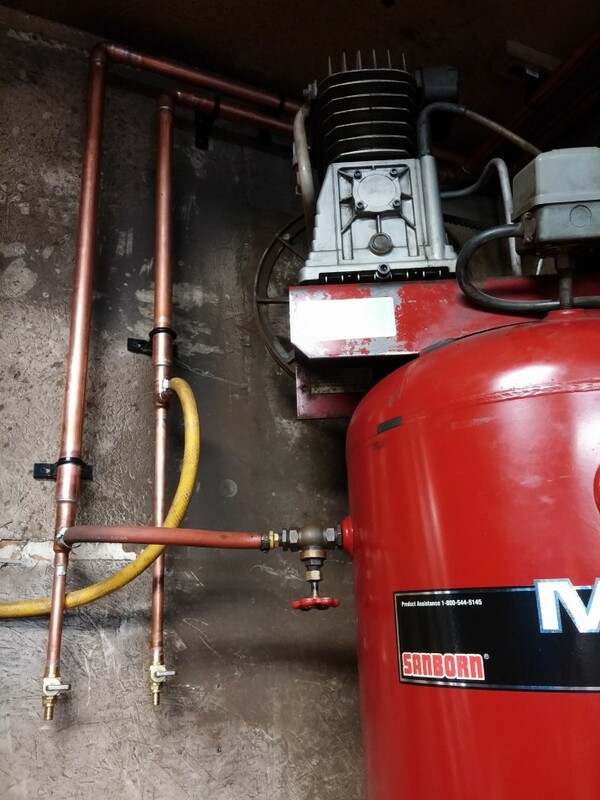 We’ve had some issues in the past with moisture when CNC cutting, so to alleviate that we finally plumbed in our refrigerated air dryer. This will reduce the air temperature of the compressed air to it’s dew point. 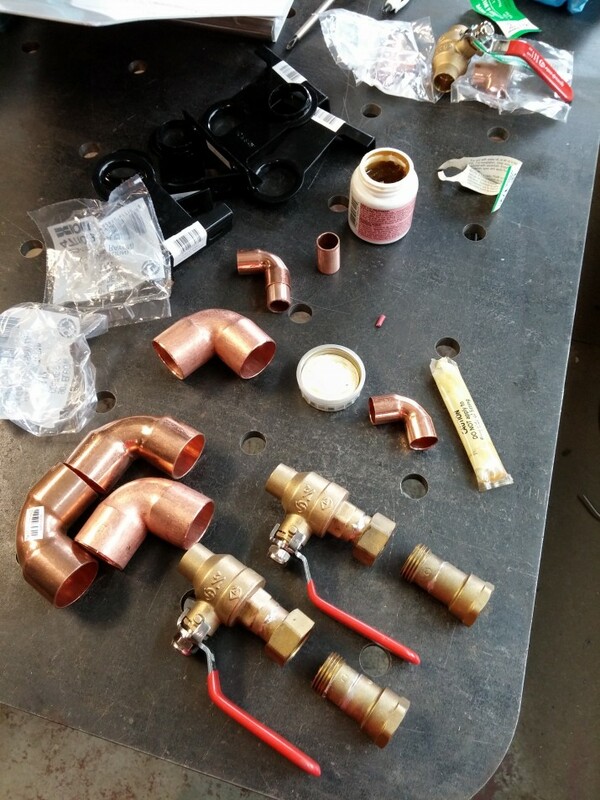 This will allow the moisture to drop out of suspension and either separate out in the air dryer or settle in the 1″ copper tubing which will then run to a set of drains next to the air compressor. This will result in dryer air for all the tools in the shop, primarily for the media blast cabinet, CNC table and powder coating gear. We’ve got more projects coming down the pipe. Stay tuned and thanks for looking! We all need time to unwind and relax. This blog post is different than any other on this site. There is no CAD or CNC cutting or even welding… So why bother write one, right? Sometimes we get so busy we begin to miss the small things and it’s best to do a soft reset. Clear everything off our plate and have some alone time, or in my case a second honeymoon with my beautiful and talented wife of 5.5 years. Our little girl is being watched by her grandmother during this duration. It was a hard decision for us not to have her come along. However, this trip will strengthen our bond as husband and wife, and our little girl will get to spend some precious time with her grandmother. My wife and I are both entrepreneurs, strategically acquiring more assets and the skills that go with developing new products and services. This allows us to offer products and services with extreme flexibility and total in-house control. With this comes a huge dedication of time and being good at balancing work and family life. Sometimes some work days go from 8am till 5pm,then it’s usually play time with our babe, Mila, until she is tucked in bed at 9-10pm (she’s a bit of a night owl). Once she’s asleep, we’re back working till midnight or later depending on deadlines or customer requirements. Our fantastic new and repeat clients allow us to be our best. This is usually by the customer expecting something unique and of very high quality. We thrive off this. Whether it be creating custom scarves or fabricated structures. Nothing is “normal”, everything is unique. When there is downtime we’re finding ways to make use of that time to work on prototypes, building our businesses and our brands. For example this blog post is being written as we are flying over the Yucatan peninsula on our way to Liberia, Costa Rica from the George Bush airport in Houston, Texas. It’s hard to rest, even on vacation. We’ve got a lot planned in Costa Rica, we’ve even pencilled in a sponsorship on this trip with the creation of our trip video. I am not a cinematographer however I will consult with those in the know, pick up a camera, use it to the best of my ability. Then sit down and learn the editing program to produce the final video. So keep your eye out for a video shortly. 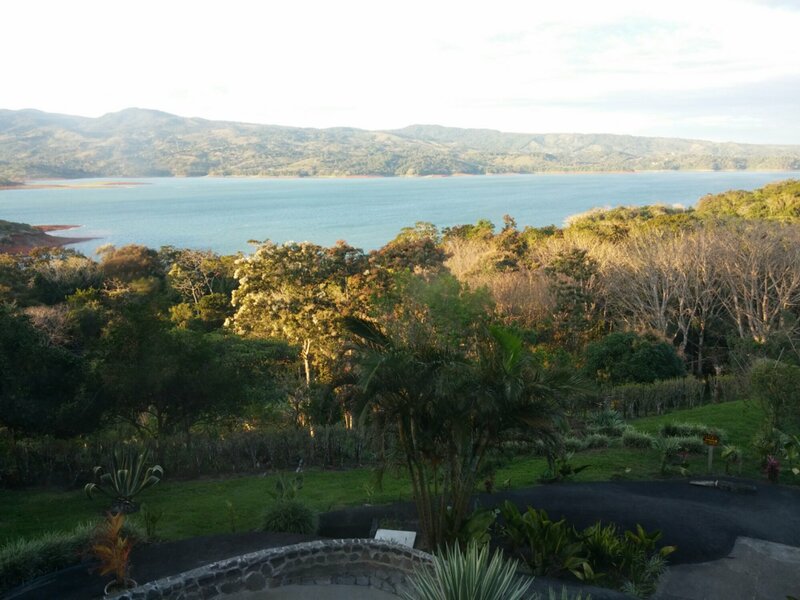 Till then… Pura Vida!